The twelfth meeting of the Task Force on Access to Justice took place from 28 February 2019 (afternoon) to 1 March 2019 in Geneva (Palais des Nations, Building A, Salle VII). The meeting aimed to provide a platform for exchanging information, experiences and good practices with regard to key recent developments in the implementation of the Convention’s pillar on access to justice and possible measures to remove barriers hampering its implementation. It thereby supported the implementation of environmental dimension of Sustainable Development Goals, in particular Sustainable Development Goal 16 and its target 16.3 (Promote the rule of law at the national and international levels and ensure equal access to justice for all) that undergo in-depth review in 2019 . The thematic session of the meeting focused on access to justice in cases relating to air quality. The Task Force identified good practices, barriers, challenges, innovative approaches, priority actions and needs to promote effective access to justice in such cases thereby also supporting the attainment of Sustainable Development Goals 3, 11 and 12. In addition, delegates continued the discussion on measures to promote effective access to justice in cases on the right to environmental information based on the preliminary findings of the survey launched at the previous meeting. Delegates also had an opportunity to share information other new developments related to the implementation of the third pillar of the Convention and examined tools to promote effective access to justice. The meeting preceded by 2019 Judicial Colloquium (Geneva, 27-28 (morning) February 2019) for representatives of judiciary, judicial training institutions and other review bodies. For more information about the meetings, please read here. Provisional agenda and documents for the meeting are available below. The background material for the meeting includes relevant information derived from 2017 national implementation reports and the 2017 synthesis report as well as the Convention’s Implementation Guide, relevant Compliance Committee findings of a systemic nature, the analytical studies and the jurisprudence database developed under auspices of the Task Force. Item 2. Thematic focus: Access to justice in cases relating to air quality. Item 3. Follow up to the previous thematic session on access to justice in cases on the right to environmental information. Item 4. Stocktaking of recent and upcoming developments. Item 5. 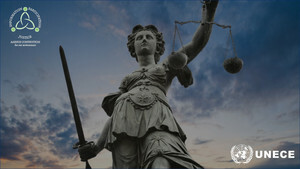 Tools to promote effective access to justice.